The mission of generative somatics (gs) is to grow a transformative social and environmental justice movement–one that integrates personal and social transformation, creates compelling alternatives to the status quo and embodies the creativity and life affirming actions we need to forward systemic change. gs envisions a movement guided by cultivated wisdom, love and rigor. 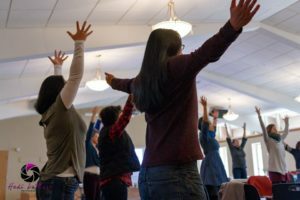 Racial Justice educators engage with their bodies at a CORE event in April 2017. Photo by Hedi Rudd. We will be offering an introduction to somatics at CORE’s Circle of Transformational Practice on Friday, Nov. 9th. Below are our reflections on some of the ways gs has affected our lives. I have done a few generative somatics trainings now. They have been very transformational experiences for me. I have been going through a lot of change and transition the past few years and the gs trainings and practices have helped me move from a deep grounded place through the transitions. These transitions include movement heartbreak, organizational break up, romantic relationship break up, friendship break up and changes, and planning a big move to another city. One of the foundational practices of gs is to develop a “commitment.” This is a goal for your own transformation and how you want to influence the world around you. My commitment has been to relax into my worth, and to be at home with myself, with my relationships, with my community, and with my life’s work. This has helped me stay rooted in the idea of really trusting myself, and doing what is best for myself that will extend to others around me. This practice along with a regular practice of centering has been foundational to my spirituality and my daily balance. The centering practice is based in 3 steps. Centering in length and dignity: feeling rooted in the ground, feeling your center just below your belly button, lengthening your spine, relaxing your shoulders and feeling the expansiveness above. Feeling the dignity that you hold as an individual connected to others. Centering in width: feeling your edges, your boundaries, where you end and others begin, feeling all the people and communities that are part of your life. Centering in Depth: feeling your back, all that has come before you today, through your life, and the ancestors and history that has shaped the current you and the current moment. Feeling through your back to your stomach and the front of your body, all of the organs in your body, and then extending out in front of you. All the possibilities to come, all the young people, the new generations being born, the possibility, the struggle, the vision, the imagination, and the shaping of the world around you and others that we will all be part of. There are lots of ways to talk about these three main places of centering, but this gives you a taste of the practice. I have been fortunate to be working with Showing Up for Racial Justice (SURJ) as a national staff, and we have been working with generative somatics to explore an ongoing partnership. gs trainers came to one of our four day staff meetings and helped us learn and incorporate somatic practices into our work. This was very helpful for me to bring these two parts of my life and work together. gs has worked with other organizations such as the National Domestic Workers Alliance (NDWA), a national organization pushing for domestic workers’ labor rights. This is an organization that I have really been inspired by and they have been greatly shaped by gs. My hope is that SURJ can build a strong partnership with gs to strengthen our work in deep ways. My feeling is that there is lots of healing and trauma-informed work that needs to be done within our movement-building spaces. generative somatics is a great way to incorporate a healing personal journey with a movement-based transformational process. If we are really going to win economic, racial, gender and environmental justice, we need practices like gs centered in our movement and healing work. I first found generative somatics at a time when I was leading anti-racism trainings for white folks. I knew in my heart this work was powerful and important to me and the larger culture and systems, yet after each workshop I would be left awash in shame and confusion. I struggled to bring my whole self into the room for fear of being seen and doing something wrong, offending someone, or causing harm. Through my work with gs I have learned to face into fears and take action at a pace that allows me to bring my whole self without bypassing my fears and also to move through my “freeze” response. I have built a capacity to be with what is uncomfortable, enough to take risks that are necessary in the kind of leader I long to be! One risk that has come up again and again for me is to be with pain, whether it is my own, is inherited, or is a way I have hurt others. In acknowledging the pain, I get closer to forgiveness and appreciation, and in the end closer to freedom. It is in taking these risks and knowing my own commitments and myself deeply that conflict and challenges become generative–experiences that bring me and others closer to what we care about. At my first training with gs, a teacher shared their commitment to love and be loved. I suddenly saw more clearly my own struggle with expressing my love for others, and I realized that I almost always completely blocked the care and love offered to me by family and loving community! Ironically this was what I most longed for at the time. I have learned to let in the love and through this have learned to more and more openly express my feeling for others. I can now easily say “I love you” when I feel it and when others share how I have impacted their lives I can evaluate and believe in my own competency in new ways. Again and again, through this work I learn to get off the binary–I am more able to find creative solutions that make space for real life complexity. Through my practice and exploration I can now face my own class, race and able-bodied privilege in a way where I do not have to shrink in shame and guilt. I can use the space I take up to stand for justice, to hold space for those who may have less opportunity, from a centered place. I can even be quiet and still take up space in my body! I would like to be in this ongoing exploration of what gs calls “centered accountability” with more and more people. At its core a lot of this has been made possible by the simple practice of being with what is. By dropping into sensations, getting more familiar with my mood and emotions and taking the time to feel, I have grown a capacity to tolerate more feeling, I have cultivated a home in my own self where I feel safe and loved and I know, more and more, what I care about and what I am willing to do. Participation in generative somatics has made a huge impact in my life and it is something I am excited to share and offer back, as my own embodiment deepens. Each time I attend a generative somatics training, I leave feeling more alive and connected to my body, my commitment to self and to the world. I learn more ways to talk about trauma, oppression and liberation, more ways to feel how they manifest in my body, and alternatives for working with them. I feel like I have more choice in responding to the ways my trauma gets triggered by everyday events and news, and have cultivated a more effective practice in resiliency. I’ve gone to several trainings in the last three years and each time I am able to notice more subtlety in the ways I am navigating my everyday environment as a white, queer, trans person and I feel more capable of working with emotions. I get clearer on my commitment to serve my communities and work towards justice and I am more connected to what is actually possible in terms of my own capacity and worth and seeing that in others. As a therapist and trainer, I have received training in a number of related somatic methodologies. Some of these discuss the body in an individualistic manner, without acknowledging systemic oppression and how that plays a part in our somas. Others incorporate social justice perspectives but fail to address things like trauma. I like generative somatics in particular because it incorporates a framework for social justice throughout the courses and addresses aspects of how we internalize the trauma of oppression. 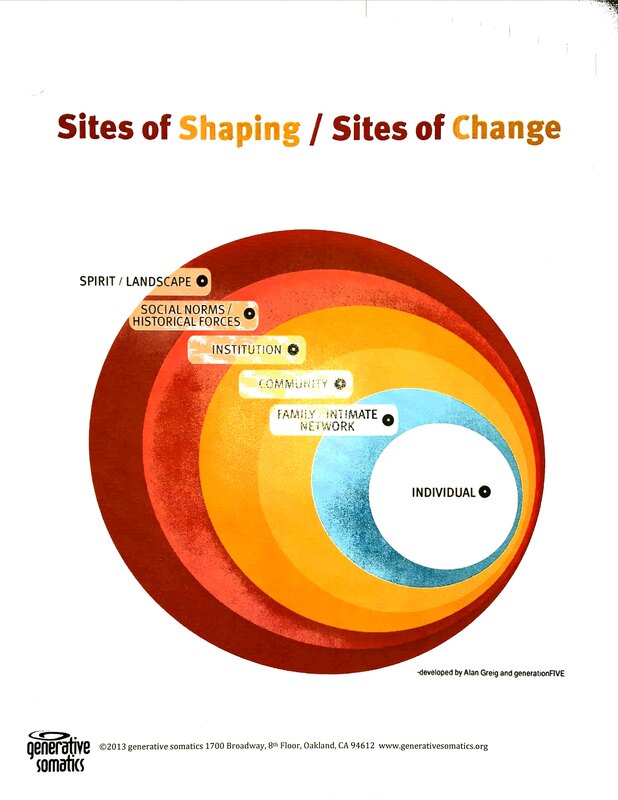 gs teaches about our ‘sites of shaping,’ which is something I’ve thought about for several years but I am learning more about how our larger environments directly impact and play out in our tissues. We literally shape our bodies and our relationships in ways that may reflect our histories of trauma or play out the ways we experience oppression. At a recent course, the trainer talked about how the environmental degradation humans have caused by monopolizing land with single crops has led to the increase in pesticides which get into the plants themselves. People who use cotton tampons are putting those same pesticides into their bodies and we are seeing a decrease in fertility. On an intimate cellular level we are noticing the ways we are affected and can thus further understand the necessity of working towards holistic systemic changes. I have significantly shifted my approach to healing and justice work as a result of involvement with gs. I have more tools for talking about how oppression and trauma express themselves through our tissues, and have learned through the bodywork courses how to manipulate the tissues to help release what is no longer serving the soma. As a trainer, my eye for the ‘shape’ of the group dynamics has also become more attuned and I notice myself offering different activities or invitations to reflect that are based in emotion, physical sensations, and mutual connection. I have more compassion for those who come to my trainings as well, and feel more grounded in my appreciation of the dignity of everyone coming into the spaces, regardless of where they are in their learning. While working with others, I have a wider capacity for observing subtle shifts in the body and notice those in myself as well. We recommend generative somatics for those wanting to build capacity for individual healing while supporting the healing of others within the context of social and environmental justice work. Please join us on Friday Nov. 9th to get a brief taste of this work. Z! Haukeness (Operation Welcome Home and Showing Up for Racial Justice/SURJ), Liz Bruno (Collaborative Massage), and Owen Karcher (The Center for Community Healing) are deeply involved in various ways in the Madison community and are advancing their journeys with generative somatics.